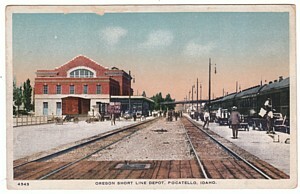 Oregon Short Line Depot in Pocatello, Idaho. Built in 1884 in the second empire style; expanded and improved in 1915. This postcard was published by the Gray News Co. of Salt Lake City. Pocatello, an Idaho railroad town established in 1892, held its first election in 1893. This town of over 3ooo elected a mayor with quite an eventful history, Edward Stein. Edward’s grandfather, Baron Von Stein, was thrown in prison for following reformer (or revolutionary) Carl Schurz. Edward was educated at the Prussian University. His republican tendencies led him to become interested in America. In 1871, he boarded a steamer for New York – without a passport. A passport would have led to German military service for Edward. The steamer’s officers were warned he didn’t have a passport, but demanded to see one anyway. After a rather vocal search, Edward had no choice but to hand over the “packet” in his pocket. It contained the money his father had given him to start out in America. The bribe worked. Edward made it to Chicago, where his limited funds finally failed. This resulted in pawning the last of his belongings. While wondering the streets of Chicago, a highwayman stuck a gun in his face ordering “hands up”. After learning Edward was penniless, the highwayman bought him a meal. He also told Edward where to find a job. This was ironic coming from a highwayman. So in 1893- a man with a titled past, who bribed a steamer officer to avoid German military service, and got robbed by a highwayman with a conscience was elected the first mayor of Pocatello, Idaho.